It’s Thanksgiving weekend in the States, so I thought it would be a perfect time to bring our resident expert Hendrik Varju back to the show. I figure many of you have a long weekend off and could use a little something to listen too and maybe inspire you while in the shop…or being dragged along OUT to shop for Black Friday deals. 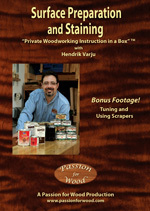 Just recently Hendrik released his two newest titles to his Private Woodworking Instruction in a Box series of DVDs. 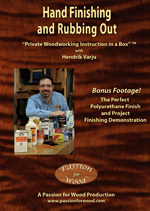 The first one is titled Surface Preparation and Staining which includes bonus footage covering tuning and using scrapers. The second title released simultaneously is Hand Finishing and Rubbing Out which also includes bonus footage covering the perfect polyurethane finish and project finishing demonstration. Both of these titles can be found at Hendrik’s website, along with all of his previous titles, www.passionforwood.com/dvds. Today’s visit with Hendrik we’ll be discussing both of these titles and so much more. Enjoy and Happy Thanksgiving to my US listeners! If you can make it the big CANADIAN HOME WORKSHOP SHOW make sure to checkout the seminars and say “HI” to Hendrik for me. For more information on the show visit canadianhomeworkshop.com/show.